It took us about 1 hour 50 minutes to drive from north London to Calcot, which is a five-minute drive from the lovely town of Tetbury. Here we strolled around antiques stores, a brilliant toy shop, afternoon tea cafes, and Prince Charles' shop. Once you're ensconced in Calcot's grounds, it's all rolling hills, slightly menacing-looking cows (did they know what I had for dinner?) and paths that are great for nap-time strolls. ... are either in the main house, or across the path in another building which mainly houses families, thanks to its extra-large family suites with separate rooms for the kids. It's right next to the sun-trap outdoor pool with loungers, which meant we could splash around in it (stretching our luck, it was mid-September but still nice as heated) then race back to our room for a hot bath in the bathroom's huge tub. Rooms have lots of luxury touches - Aromatherapy Associates and Child's Farm potions, bath toys, a huge tub and glass shower, a basket of fruit, gingerbread men for the kids, big bed with super-fine linen, proper coffee machine (parental essential, obvs), books and magazines (including Sunday Times Travel and House & Garden rather than the usual advertising bore tomes) plus a vintage kids' car just outside our room that gave tiny man hours of fun. There were also children's books and quirky decorative touches like a fantastic Arabian mural in the kids' room... which also had its own TV in case early morning CBeebies is required for you to get your lie-in. Our favourite thing was the fact that there was a separate children's room - meaning you don't have to tip-toe around in the dark like a Lemming after dinner. Tiny man even spent his first night in a bed at Calcot as, although a spacious travel cot was provided, there were in-built bunk beds in 'his' room and they looked a LOT more appealing. The family rooms have in-built room-listening intercom so, if you like, you can dine in the hotel's restaurants across the path whilst reception listen in for any noises. 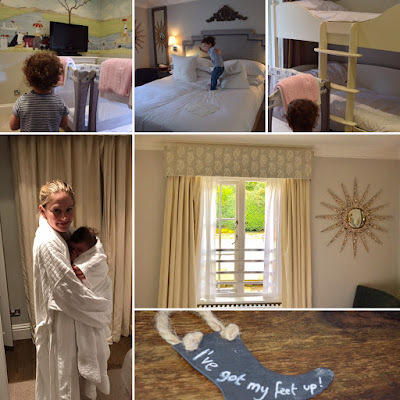 Each family room also includes a baby box with a steriliser, bottle brush, Fairy liquid, bottle warmer and changing mat - although we only discovered this at the bottom of our wardrobe on the last morning of our stay, so look out for it. Our request for a potty and nappy bin was met within minutes; they're seriously well-equipped. Being in the separate family room building does, though, mean you'll get wet if it's raining at breakfast time or going to the spa etc as there's no internal linking corridor. And there are steps to leave the building and get into the main part of the hotel, so not ideal for buggies. No pretentious menus at either Conservatory's more deluxe meals, or the gastro-pub-y Gumstool Inn - and the food is excellent at both. Not cheap (mains hover around £20 at the Gumstool and £30 in the Conservatory) but well-cooked, beautifully-presented, and delicious, plus there's a large range including separate veggie and gluten-free menus. (Allergies in general are taken very seriously here: all nutty items at breakfast, for example, are isolated in a corner). 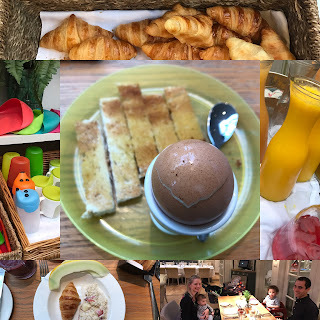 Breakfast was a small but nice buffet (fresh fruit, croissants, cereals, yogurts, jams, smoothies and juices and oh-so-good Bircher muesli), plus Full English, pancakes and other egg options from an (included) menu. There's a helpful corner packed with kids' crockery, cutlery and bibs. The staff really stand out - they were all so friendly, and helpful with the kids you feel far more relaxed than at uber-luxurious country hotels which cost far more. At dinner, tiny man made his way through the three-course kids' High Tea - mainly organic, all homemade food, not a fish finger in sight - and included in a £30/kid fee for all family bookings. Later we dined on crispy duck salad, lamb, chicken kiev, chocolate fondants, homemade ice creams and cheesecake, and dug into the long cocktail menu too... And when tiny man became increasingly vocal about sharing some of my drink (with vodka in? no chance!) the barman swiftly produced a mocktail that matched my toddler-coded request of being '90% H20..) phew - tantrum averted. If you've got kids, the Playzone is going to be your friend: it's basically a huge room filled with every toy you can imagine, plus more arts and crafts than Blue Peter, a sand pit, toy kitchen, train sets, dolls, dressing up clothes... It's Ofsted-registered and fully staffed, so you can leave your kids there if you want - we never have before but this place was so good that tiny man didn't blink when we suggested it and, cliche but true, really did have to be dragged away when we came back an hour later. It's free, but you should book in advance as it does get busy. And upstairs, there's computers, pool table, games etc for older kids too. 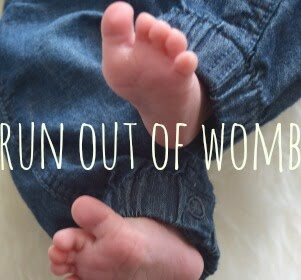 And Calcot is offering ROOW readers a special drinks offer worth nearly £30: when you book and mention Run Out of Womb, parents can nab a free ‘Car journey survival’ cocktail each and kids receive a mocktail during the stay. Offer is valid until 31st December 2017 (inclusive).